Our first big trip of 2019 technically started in 2018. Michael and I departed for Ho Chi Minh City, Vietnam just a few days after Christmas. This would be our first stop on an unforgettable 2-week journey through Southeast Asia. It’s been nearly 2 years since I last posted on my blog. Time flies. After moving back to Dallas in 2016, I simply got out of the habit of posting on a regular basis. Once I got behind, it was really hard to catch up again. In that time, I realized how much I missed keeping up with Frequent Wanderer. It was a fun, creative outlet for me during our 2 years in London. It provided me a place to document my own experiences, mostly for myself but also for friends and family. Spending time with family: Every year that goes by, I have a growing appreciation for the time I get to spend with family. Yes, we argue incessantly both at work and at home. However, I cherish time spent with my parents, my sister and my niece and nephew. This year, Kressa turned 2 and developed a new found love (more like obsession) for all things Frozen. Rae and Kurt welcomed a new addition to the family: Max! It’s been so fun watching him grow and seeing his personality develop. He just started walking! Michael has also become such an integral part of the family. Kressa and Max love him (arguably more than they love me), and after the meal he prepared this past Christmas, I’m pretty sure he’ll be cooking for all future family functions. Climbing Mount Kilimanjaro: One item that has long been on Michael’s bucket list is to reach the summit of Mount Kilimanjaro. In January 2018, we finally checked this one off the list. It was an arduous 6 days / 5 nights climb to the top along the Rongai route. We struggled both physically and mentally, but reaching the summit was a once in a lifetime experience. For those considering the climb, we highly recommend Duma Explorer. Our team of guides and porters was awesome and instrumental in helping us ascend Africa’s highest peak. With all that said, I’m in no rush to climb any more of the world’s tallest mountains. Seeing friends afar: Over the past 10+ years, Michael and I have made some great friends while living in DC, NYC and London. Unfortunately, we don’t get to see most of them all that often anymore as everyone is scattered around the world. In our travels this year, we’ve been fortunate enough to spend some quality time with friends far and wide. True friends are those who you may not see all that often, but when you do, you pick up right where you left off. 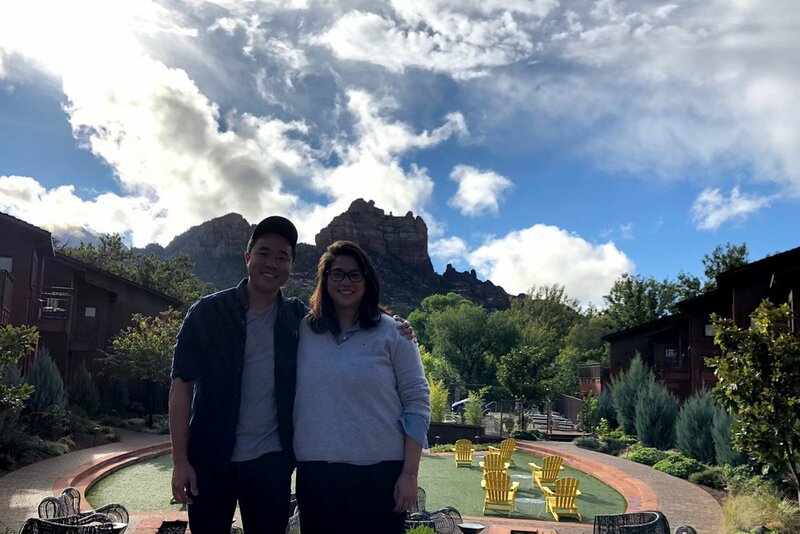 Whether it was a weekend getaway in Sedona with Maryann, a birthday celebration in Belize with Coco and Peter, or a stopover in Japan with Jonas and Jen, we’re so thankful for the time spent with some of our closest friends. Growing the business: Rae and I tend to be pretty coy when it comes to talking about our business. However, I’m really proud of what our team accomplished this past year. From selling out of new handbag styles and putting on a successful Leatherology event in LA to launching the new Coverstore custom covers program and beating our sales target, 2018 was a great year for the entire DCI family. This is not to say that we didn’t experience some bumps in the road. Owning and running a company is an extremely humbling experience. Nothing can prepare you for the highs and lows of business ownership. Without question, I learned and grew more professionally in the past year than I did in the previous 10+ years combined. Getting to know our own city better: Whether you live in a vibrant, cosmopolitan city like NYC or a burgeoning metropolis like Dallas, it’s easy to take your own city for granted. Dallas often gets a reputation for being a bit uninspired and stodgy. However, when you peel back the layers and dig a little deeper, you’ll find a diverse and eccentric city that is rapidly changing. We’ve loved trying new restaurants (a few highlights include The Charles, Petra & The Beast and Taco y Vino), discovering new cocktail bars (Lounge Here, Las Almas Rotas, Bourbon & Banter) and visiting world-class exhibitions at The Fort Worth Modern and the Dallas Museum of Art. Run 2 half marathons: While living in NYC and London, signing up for races was always a good way to keep my fitness in check. They gave me milestones to work towards and held me accountable for getting in race shape. In the last 2 years, I haven’t run a single half or full marathon. That’s going to change this year. We’ve already signed up for the Rock & Roll Half Marathon in Washington DC this spring and are researching options for the fall. Take 4 tennis lessons: My 2nd health-related goal is to start taking tennis lessons again. I haven’t picked up a racket in years, and I haven’t consistently played since, well, high school. Any suggestions for tennis instructors in Dallas? Prepare 12 dinners by myself: I’ll admit that I’m a horrible cook. I’ve even managed to f*ck up boxed mac & cheese. Thankfully, I have Michael and UberEats, both of whom are amazing cooks. With that said, I’d really like to challenge myself to be a bit more competent in the kitchen. This includes learning to cook healthy meals (in lieu of McDonald’s). Write 24 blog posts: Last but not least, I’m making a commitment to maintaining this blog. We just got back from a 2 week trip through Southeast Asia. I plan to write about our stops in Vietnam, Cambodia and Laos while they are still fresh on my mind. Stay tuned for more! Michael, Rae, Kurt and I just returned from a short road trip to Coleman, Texas for a one night getaway at Rancho Loma. Less than 3 hours away from Dallas by car, it was the perfect destination for some much needed R&R. Dallas's natural beauty (or lack thereof) doesn't get much love, so it's refreshing to find lush rolling hills and untouched wilderness so close to home. It's great to see what Robert & Laurie have created at Rancho Loma and all the exciting projects they have in the works in nearby Coleman. We were treated to delicious food, surprisingly good Texas wine and wonderful company all against an even more surprisingly beautiful landscape (see cover photo taken by Kurt). Nearly 6 hours in a car also meant lots of arguing, napping, snacking and of course, music! Check out the video playlist below for just a few of the songs I've been listening to on repeat this spring! For the longest time, my sister wouldn't stop telling us about this awesome cooking class she took out in West Texas a few years back. She kept encouraging us to sign up for the next one. However, I couldn't fathom suffering through an 8 hour drive to the middle of nowhere just for a cooking class. Thankfully, I eventually caved in. Last November, we gathered up a group of friends and ventured out west to Marfa, Texas for Camp Cooking at El Cosmico. Yes, the drive was long. However, it was absolutely worth it. Hosted by Lou Lambert, Camp Cooking was the perfect introduction to a part of my home state that up until then felt so foreign to me. The food was downright delicious. A few of my personal favorites were the tortilla soup, chile relleno, buttermilk biscuits and griddled pancakes. I'm pretty sure I put on 5 lbs in less than 48 hours. However, what was nearly as memorable as the food itself was the backdrop. I never knew that Texas was home to such jaw-dropping and dramatic scenery. Our original itinerary for the trip included 4 days in Big Bend National Park. Unfortunately, those plans were dashed last minute. We're already eager preparing for our next trip to West Texas in hopes of spending some more time in the region...and devouring a second round of pancakes. Big thanks to Lou, James and the entire team for an amazing culinary weekend! It's been over 4 months since my last post. With blogging, you're either on a roll or you hit a complete roadblock. I simply got out of the habit of writing on a consistent basis, and it's been hard getting back into the swing of things. With a new year comes some new perspective and commitment. There's so much from 2016 I still want to write about, but I also don't want to spend the entire time playing catch up. I'm pretty sure that's what got me into this rut in the first place. I definitely plan on finishing out my Iceland guide (eventually) and sharing recommendations from recent trips to New Orleans, Marfa and Copenhagen. Otherwise, it's all about looking forward. We have a few exciting trips lined up this year, including an upcoming 2 week stint in New Zealand and Australia. Beyond that, I plan on focusing more on my hometown of Dallas - a long overlooked and underrated destination. With a recent new addition to our family and a looming home closing date, this year is just as much about staying put as it is about frequently wandering.